1. How Secure are Your Golf Contest Prize Packages? 2. How Long Does It Take To Cover My Event? 4. Where Do I Fax Back My Application To? 5. Can I Order Hole in One Insurance Without Bonus Prizes? 6. I Run a Lot of Contests, Can I Get a Discount? 1. How Secure are Your Contest Prize Packages? We can secure coverage for your event in as little as an hour. 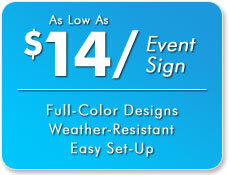 For events requiring signage, we can overnight signs to you if your order is received by 3:00PM EST. Additional rush shipping fees may apply. We are happy to accept VISA, MasterCard, American Express, and Checks. Please Fax Applications to 610-825-8004. If that line is busy, you may also use our alternative line at 215-893-3990. All of our bonus prizes are included with every hole in one prize package. They have no influence on the price of the package. However, if you do not wish to receive them, let us know and we will note that on your order. Yes you can! Call one of our event specialists, explain your situation, and tell them you would like to participate in the Tournament Directors Program.